Summary, Feb 2016: This thread documents two separate attempts at the same project: recreating the British rail network using Simutrans Experimental. More recently, I've also been working on a detailed map of London's rail network (see this post onwards). There are also a series of 20 video diaries for the UK map produced between 2012 and 2014. The Youtube playlist is here, and the first episode is below. The first attempt was completed in 2011, and you can see the final results here. You'll find that these savegames don't run especially well in up-to-date versions of Simutrans Experimental. In 2012 I started a new version of this project from scratch, using a more detailed scale and with much more ambitious aims for accuracy, using the improved resources given by updates to Simutrans Experimental in the intervening year. You can track the progress of this new project at the end of the thread, starting here. The trains used in this project can be downloaded for pak64 - both standard and experimental - here. This map is not finished, but I wanted to share a work-in-progress version in order to showcase some of the very powerful features of Experimental. UK rail network now complete as of 27/7/11! I recommend opening this map in Experimental 9.3, if you can find this version, since I have not yet optimized it for the deceleration changes implemented in 9.4 onwards. 1. This is intended as a simulation primarily of rail passenger flow. As such, other aspects take a back seat. I've cheated to a huge degree by extending stations with bus stops. Partly this is to avoid having to build too many bus lines -- and partly it's to simulate the fact that many people will travel to a rail station of their own accord before starting their journey. Buses are used only where there are no trains (and occasionally to provide extra links -- see the East Midlands). Once the rail network is complete, I plan to add more buses. 2. Vehicles are not intended to be accurate. There are few good UK trains for pak64. Almost all the trains I've used are electric, which means that many lines are electrified which would not be in real life. Also, since my main concern is to simulate accurate journey times, the top speeds of vehicles have been altered (and are not always true-to-life for the relevant routes). Costs are also artificially low in order to allow me to build the network without obstruction. I plan to raise them later. 3. Many large inner-city stations have underground sections which do not exist in real life. For example, Manchester Piccadilly is on three levels. This is for space reasons -- because of the scale, 18 platforms at Waterloo (for example) would require a station 4.5km wide...! Similarly, local metro systems (e.g. Manchester Metrolink) are often underground when they would normally run above ground. For similar space reasons, a few stations in London (and one or two elsewhere) are omitted. 4. Almost all routes run to a schedule, using Experimental's fantastic 'convoy spacing' system. Most routes run approximately half-hourly (7 convoys per month). I'd like to make this more realistic, but I'm stuck with a "passenger max wait" time which means that passengers will only wait for around half an hour before joining the "unhappy" pile. If anyone knows how to change this in-game (or by editing the save-game), I'd be very grateful! Because many services run more frequently than in real life, some areas have double-track where it should be single-track, and even four-track where it should be two-track. Also, some 'semi-fast' services are omitted. For example: there is no semi-fast Euston-Milton Keynes service. Instead, the stopping Euston-Watford Junction service is extended to call at all stations to Milton Keynes. 5. A note on cities. Each city has been built from scratch, building by building. Populations are not intended to be realistic, but population ratios are. The population of each city is approximately 13.6 times smaller than its population in real life. Note that sometimes I've included surrounding areas as part of a larger city when they wouldn't normally be included in the population -- and some smaller cities are combined together. I already have over 700 cities and I'm worried that the game might have a limit at 999. Does anybody know? 6. The geographical aspects of the map are not perfect. I think it's a little wider than it should be, and some of the city placements are slightly out. Again, I plan to correct some of this later. 7. Not all stopping patterns are accurate. Partly that's because you can't vary stopping patterns in-game like you can in real life (e.g. some Euston-Manchester trains go via Crewe, some via Stoke). Partly it's to regulate passenger flow: each major station on the West Coast Main Line receives a call from only one express train, in order to avoid passengers changing where they shouldn't. Something similar happens on the ECML and the MML. 8. No freight yet; maybe later! I've still got lots of work to do, but so far I'm really impressed with just how easy it is to accurately simluate passenger flow within Experimental. What's more, most of the journey times are within the margin of error of being correct! I'd be very interested in your comments and feedback! One more thing: if you look closely, you can find my (very poor) first attempt at drawing for Simutrans: a commercial building called 'Greggs', which is a ubiquitous bakery in the UK. In fact, it's in the above screenshot! Can you spot it? that might have taken a bit more time than a rainy saturday afternoon. My goodness, what a save game. On a side note, seems to be a lot of Japanese influence in the UK, with the pachinko parlors and all. Yeah, I've used a lot of graphical add-ons from japanese.simutrans.com. In the future I plan to use more graphics from pak.German, since those will fit better. It your pak-baker.rar playable with simutransstandart? or it a Pakset for Simutrans Exp. I Have be downloaded your first jha4ceb-pak.rar from http://simutrans-germany.com/files. I was very nice games what you be have make. It's not a pakset as such, but rather just pak64 with a few addons from the Japanese simutrans website. It will work with Simutrans Standard, yes. Note that it's not really suitable for ordinary games, because many of the costs are artificially low for the reasons given above. Carlbaker i Collect simutranspaksets each pakset how i becam be geting in my liberty. Here's an updated version and more screenshots! New: Wirral and Merseyside, Yorkshire and the Humber (Leeds, York, Bradford, Hull, and corresponding local services), East Kent, South West (Dorset, Devon, Cornwall), South Wales Valleys. A quick note for those using the latest version of Simutrans Experimental -- 9.8. I've not yet optimised this map to take into account the new deceleration behaviour, so you'll find that services are slower than they should be. What's more, there will be severe overcrowding on some mainlines. At the moment this map works best with 9.3. I hope to optimise it for 9.8 very soon. The lines around Brighton, does it include all stations such as Hove, Aldrington, Portslade, Fishersgate etc to Portsmouth/Southampton and the stations such as Preston Park, Burgess Hill, Hassocks going north to London and then London Road, Molsecoombe, Falmer etc towards Lewis and Ashford? It won't open, as it goes, in 9.8, does anyone have a 9.3 exe? EDIT: Ignore me, although it is just a "file" file type, you need to add .sve to the end of the file name my bad. EDIT 2: Probably the best map i've ever seen! Even with the mentioned inaccuracies, it is still definately, clearly and amazingly, fully the National Rail network! Obviously a bit of comprimise on the lines (No Brighton - Southampton, Brighton - Portsmouth, Brighton - West Worthing) but that'll obviously be the case given the detail and size of the map. Top work, sir. As you say, there isn't the same variety of services that you'd find in real life. Simutrans doesn't really allow for irregular services, so I run just a few regular services which encompass almost all of the routes you mention above. For instance, I run a very regular Brighton to Worcester service, which encompasses the fast services from Brighton to Southampton, Southampton to Bristol, etc, even though this route doesn't run very often in real life. The main direct route that's lost from Brighton is to Portsmouth. Maybe I'll think about adding that, although the Portsmouth tracks are already pretty busy. The main reason I don't run *all* of the real-life routes is because it would make the tracks horrendously overcrowded and would compromise the accuracy of the journey times. I totally understand why every route can't be run, and the comprimises work so well. it's an impressive feat to have researched and built that map. I've noticed a... bug of sorts. Manchester at 1:36 in 2036 on 9.8 causes two lines to be stike, the Manchester-Rose hill and the Manchester-New Mills line. Yep, there are definitely still some wrinkles in the track design here and there! Last night I had to fix problems at Worcester and Porstmouth which caused untold chaos. I've not come across trouble on those Manchester lines before, though, so I suspect they are an artifact of the decelaration changes in 9.8. I haven't yet altered the vehicles to take account of these changes, so if you open the game in 9.8 everything will run a little slower than it should be -- presumably resulting in congestion on these already-crowded suburban lines. 9.8 has a nasty bug with respect to journey times, so I don't plan to optimise the save-game for the latest version until that's fixed. 9.9 seems to be in the pipeline, so hopefully I'll be able to do that soon! I did suspect 9.8 had something to do with it. Do you plan on going north of the wall once wales is done? Certainly! I've finished Wales now and completed all lines as far north as Barrow-in-Furness. It's probably about time I uploaded an updated version! Gatwick Airport. Note that Gatwick has tourist attractions posing as airport buildings. This is because I'm not using passenger planes on this map but I still wanted to simulate passenger traffic to and from airports. There's a mail plane at the airport which is for eye-candy purposes only. It flies between Gatwick and Liverpool John Lennon Airport. The two blue trains are Victoria-Brighton fasts, which double as the 'Gatwick Express'. The other train is a stopping service from Victoria to Horsham. North of Bristol -- a busy junction. Trains, from left to right: Cardiff to Taunton service (at Filton Abbey Wood); CrossCountry Edinburgh to Plymouth service; Swansea to Paddington service; Crosscountry Plymouth-Edinburgh service; and finally, Worcester to Brighton (via Bristol) service. Central London. All of the stations you can see also extend underground (for space reasons), which is why they look so small and empty compared to their real size. As a general rule, local services run overground in London and longer-distance services run underground. At Waterloo and Vauxhall you can see various stopping services to Weybridge, Guildford and Kingston. The train at London Bridge is running from Dartford to Charing Cross via Woolwich. The map now goes as far north as Carlisle and Darlington -- and almost everything south of these towns is now complete. The end is in sight! 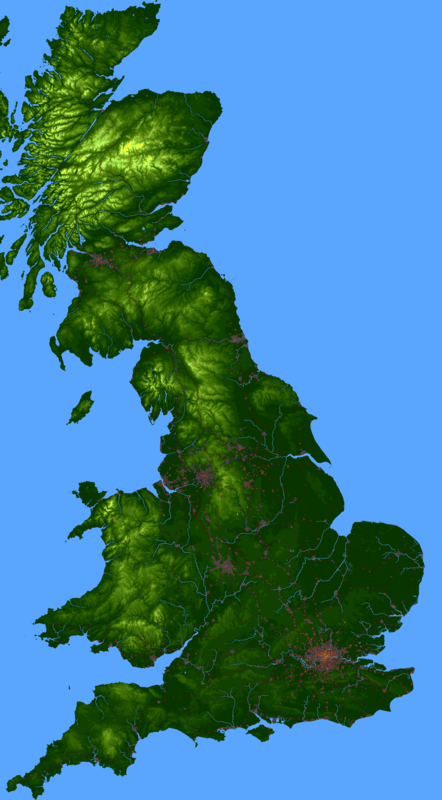 A bit of a milestone -- England and Wales are now complete! To celebrate, here's an updated savegame! Edinburgh. There are London and Glasgow services waiting at Waverley. There are more tracks underneath the surface in order to save space! A snapshot of the underground view of Central London. A huge mess -- this is why the "layers" view is necessary! If there's any other area you'd like to see a screenshot of, let me know! Hmm. Keep on getting a big ol' error. Note that you'll also need the pak folder from the first post. Do you build the railroad through the cities or grow the cities around the stations? I built the cities (with public player) and the railroads at the same time, so I left room to build railroads through the cities. City growth is effectively disabled. The map was made in 'sandbox' style, I suppose, rather than being a 'proper' Simutrans map in that sense. thanks. I had been trying to find a good link to exp, but couldn't find a download in my half-asleep, rushed state. Which map did you use? Sorry to be a pain drag this back up! The map I used for this wasn't so great, really -- especially with respect to the hills. If you want something of comparable size, I recommend you take the map on this topic, and half its dimensions. If you're not able to do that, let me know and I'll post a smaller version on that topic. Sorry to bring this up, but the link is dead. Is there any possible chance you can upload the savegame again? Thanks!